Banter really sells the camaraderie of the team. Still not much in the way of character development. At risk of turning into Tony Stark and friends. The Guardians blow off some steam after their narrow escape from the prison planet only for things to go somewhat awry. Guardians of the Galaxy continues to be one of those frustrating cases of something that’s good but could be so much better. This issue finds the team partying hard after the frantic escape last issue and is a rare example of a team just ‘hanging out’ for want of a better term and it works because of the ragtag nature of The Guardians. The idea of Drax, Rocket, Peter Quill, Gamora ,Groot and Tony Stark kicking back in the equivalent of the Star Wars Cantina is a nice touch and something that wouldn’t work with any other team in comics pretty much. That they are cheering Groot ,their saviours name, further cements the idea that this is a team made up of characters that actually like each other which is one of this titles biggest qualities. There’s never a sense that they are together purely to save the universe from nefarious plots and predacious aliens, that seems like a happy side effect to them being friends, especially in the case of Groot and Rocket who seem to have the most bizarre bromance going on in comics. Tony Stark though still seems to be the only character here that you actually know. Whilst Guardians of the Galaxy has a pretty big fanbase which undoubtedly has been following their adventures for some time for readers new to the title it’s still a bit unclear as to who these characters are. The Guardians let off some steam. This problem is amplified this issue by events involving Tony Stark, who really does earn the ‘that guy really needs a slap’ award it has to be said and Gamora, undoubtedly the best character in this title, seems to get shortchanged too. Gamora is often referred to as ‘The Deadliest Woman in the Universe’ and whilst there’s been little in the way of explanation for that so far, she has definitely proved her merits as a fierce and intelligent member of the team and an accomplished warrior. 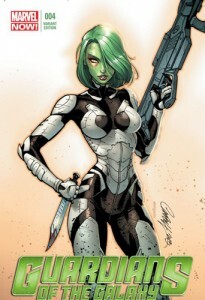 That Gamora and Stark’s flirtation ends with the seemingly inevitable conclusion despite Gamora’s statement of ‘You’re going to have to do better out here’ after Stark makes a pass at her seems to happen far too easily. A further development robs the character of her strength and having to be saved by the ‘boys’, seems to smack of gender tropes re-asserting themselves even if unintentionally. In a title with 5 characters besides Stark little time has been spent on any of them so far and to have a considerable amount of this issue spent on Stark makes this seem more like ‘Tony Stark and friends’ and makes you wonder who is the guest star here? What saves this title though is the banter between the team members and the action, in the form of a bar brawl this issue, its chaotic and does feed into the idea that carnage seems to follow the team wherever they go and the consistently good art. 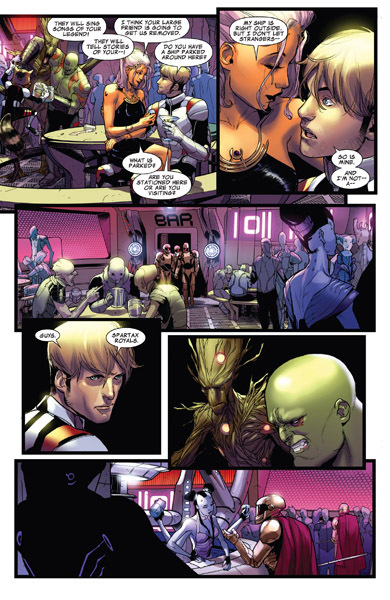 Sara Picelli does a good job of capturing the chaotic nature of the bar, with some nice panels of background action giving the place a real sense of life and the contrast between the crowded scenes in the bar and Gamora’s situation outside is a well used device. The only thing that seems problematic is Rocket’s appearance, Mike Mignola’s work on the original limited series set the bar for that character way back in the mid 80’s and nothing since has matched it.